"One of the finest airport hotels in the world". Award winning hotel featuring 276 deluxe rooms and over 1000 square meters of conference space all on the one floor. Ideal for both fly in - fly out meetings or residential conferencing. With onsite Audio Visual personnel, state of the art equipment and wireless throughout the hotel, PARKROYAL Melbourne Airport is the ideal place for your next meeting or event. Connected via two sky bridges to the Melbourne Airport terminal, this ultra modern hotel is ideal for small, medium and large meetings and events. Save time and money with the ease of fly in - fly out access and discounted car parking at just $15 per day. Enjoy charm and modern comfort at PARKROYAL Melbourne Airport. Choose from 276 non-smoking hotel rooms featuring cool colour palettes, contemporary design and fabulous views of Tullamarine. Our rooms are thoughtfully equipped for both work and relaxation with a generous desk, broadband Internet access and complimentary amenities. Sink into the comfort of our plush cushion-top beds and take in spectacular views of Tullamarine Airport, the city skyline and the Macedon Ranges. Keep up with work, family and friends via high-speed Internet, choose a film from the selection of in-room movies or enjoy a delicious in-room meal. Whether you are visiting us for business or leisure, you will appreciate a welcoming hotel room which provides you with easy access to Melbourne Airport. With a whole level of the hotel dedicated to business and events facilities, the Parkroyal Melbourne Airport offers rooms that can be tailored to your most specific requirements. A perfect meeting venue for interstate business travellers and a centrally located venue for a conference or event, the PARKROYAL Melbourne Airport provides the latest in technology and multi media equipment, wireless high speed internet access in all meeting rooms, a fully serviced business centre. 16 meeting rooms including the elegant Victoria Ballroom. 14 room with natural light. Catering from 2 to 300 people. 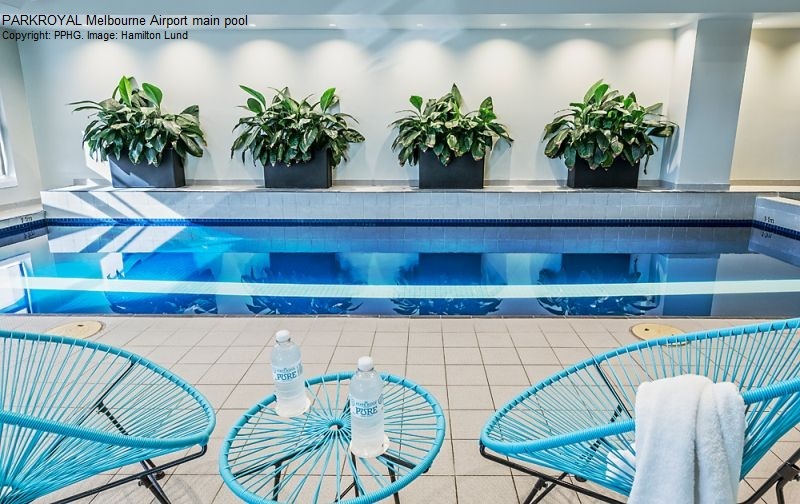 Get energised, replenish your soul and feel alive with a range of recreational amenities including a heated indoor lap pool, spa, sauna and steam room at our PARKROYAL Melbourne Airport Tullamarine accommodations. Enjoy 24 hour access to our gymnasium to recharge after a long flight or gear up for a busy day. Full range of state of the art audio visual equipment is available on request. Staging Connections audio visual staff are conveniently located on site to meet your every need. With a whole level of the hotel dedicated to business and events facilities, the Parkroyal Melbourne Airport offers rooms that can be tailored to your most specific requirements. A perfect meeting venue for interstate business travellers and a centrally located venue for a conference or event, the Parkroyal Melbourne Airport provides the latest in technology and multi media equipment, high speed internet access in all meeting rooms, a fully serviced business centre. From April 1, 2016, visitors can delight in PARKROYAL Melbourne Airport's swim and lounge package for only $15, offering more than your standard airport lounge with access to the hotel's leisure facilities, lounge and AIRO Bar & Restaurant. Announced during AIME 2016, PARKROYAL Melbourne Airport will soon offer an indulgent yet inexpensive lounge and swim package to delight even the most travelled of guests. PARKROYAL Melbourne Airport is pleased to announce the recent appointment of Jee Whan Lee as Executive Chef. Lee will oversee the hotel restaurant, Airo with its seasonal menus, Airo Café, plus the hotel’s 24 Hour In-Room Dining.